Since May 2018, I have been developing a crowdfunding token distribution and tokenomic model that mathematically guarantees the ICO price is the lowest price an asset ever trades. I am calling it The Unsinkable ICO Standard (TUIS). In order to prove the efficacy of my model, I have decided to launch a token on the Stellar network – the first “Unsinkable” Investment-Buyback-in-Perpetuity DAICO (IBiPDAICO). The general public and novice crypto investors have been misled into believing that the initial coin, or initial public offering is the lowest price – initial. However the reality is that most ICO projects currently offer significantly lower coin/token prices to large investors via private pre-sale or pre-ICO. The result is that most ICO assets trade below ICO price for weeks or even months after ICO and the smaller investors could have gotten a better price post-ICO. The Unsinkable ICO Standard fixes this problem. The Investment-Buyback-in-Perpetuity DAICO, or IBiPDAICO, is my improvement on Vitalik Buterin's DAICO concept. An Unsinkable 100% IBiPDAICO offers a guarantee that anyone who wants to get their initial investment back, can. A money-back guarantee. Additionally, the ICO investors control the token issuer's access to crowdsourced funds by removing their coins/tokens from the circulating supply and temporarily forgoing their money-back guarantee. Immutable HODLing. An asset stays Unsinkable by offering enough funds for token buyback at ICO price with immutable circulating supply management to mathematically ensure the asset can never trade below ICO price. Circulating supply never exceeds the amount of funds offered for buyback at ICO price. Essentially, an Unsinkable IBiPDAICO is an ICO with a low-price and money-back guarantee where investors can grant issuer access to crowdsourced funds by HODLing. There's no promise of profit, maybe no one will want to buy it above ICO price after the ICO, but you can always get your investment back – assuming the buyback funds don't get stolen. The Unsinkable Project is seeking peer review. I greatly appreciate constructive criticism and feedback for improvement. I am sure there are mistakes. Please help me correct them. Those who want to see crypto succeed and go mainstream wish to get rid of the scams and create a new standard of transparency. The Unsinkable ICO Standard. The public has been led to believe the ICO price is the beginning, the lowest price. The INITIAL coin offering. The Unsinkable Project aims to make that true. The ICO price should be the lowest price an asset ever trades for, and Stellar Lumens (XLM) assets are perfect for deploying this standard. Stellar assets have a built in trading function. This allows the Stellar network itself to act as a decentralized exchange (dex) for assets on its “blockchain.” New assets are trade-able immediately for any other asset on the distributed ledger technology (DLT). The Stellar network also supports near instant confirmation times, negligible transaction costs, and thousands of transactions per second. An ICO can be performed on the Stellar website in 10 minutes with no coding experience for under $5. These qualities, along with being impervious to 51% attacks, make the Stellar network ideal for launching the Unsinkable Project. A Stellar asset could be the perfect solution for day to day crypto transactions and prime to replace bitcoin as a store of value if a trustless deflationary token ecosystem were introduced. Unsinkable.io will eventually host a UI for interacting with the Stellar dex. This Unsinkable Exchange will only list coins/tokens that meet The Unsinkable ICO Standard. It will be open source. It will eventually feature gameified, social, and algorithmic trading – compete with and follow other traders, automatically copy successful traders, strategy creation and algo/bot marketplace. 1Broker, eToro, Binance, and Kryll.io inspired. I believe that launching The Unsinkable Project on Stellar has the potential to create the largest decentralized, tokenized, trustworthy, global, free-trade marketplace ever conceived. Harnessing the collective genius of all mankind for the betterment of tomorrow. I have an on-staff animator working for team allocation vested UNSK on many company videos. This is the first explanatory video for The Unsinkable Project. It is currently “unlisted” because I have not received a response from my email to trademark@stellar.org on 7-17-18 about using the Stellar mark. Hopefully this usage is acceptable. Please let me know what you think. Ok, I get the sentiment, and it looks great for the investor. But what about the entrepreneur? You know, the guy who wants to work hard, hire top people, create an innovative solution, and even market it? That COSTS money. The blanket statement of "money-back guarantee" kinda makes all of this impossible, no? Yes, there are scammers and some bright 17 years olds that will work for free. But mature, experienced people? Those who you would like to invest in - they COST money. Absolutely correct. Thanks for a great question. If you build a truly exceptional deflationary utility token ecosystem with real industry demand, presumably based on upsetting an established industry with a more competitive business model utilizing a custom ICO asset and reduced fee structure, then potential employees should see the value in working for vested tokens. The HODL Wallet. By providing speculative investors with incentive to immutably HODL, you reduce the circulating supply and their buyback funds become available for dev and employee pay, server costs, web hosting, marketing, whatever ops you need. Unsinkable Tokenomics enable nearly trustless, low-risk tokenomic ecosystems, helping smaller and riskier projects attract ICO investors. Unsinkable token issuers for small ICO projects also benefit from a larger market cap, more tokenomic transparency, and liquidity than they would presumably have without TUIS. 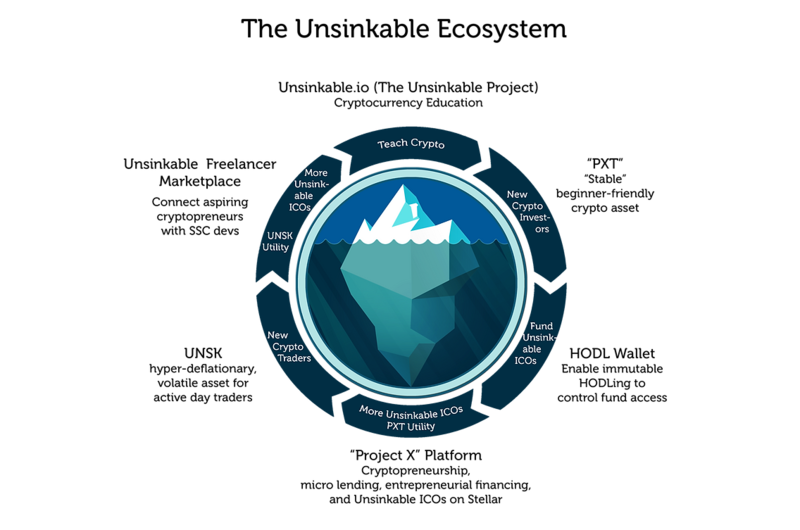 Additionally, the tools available on Unsinkable.io will make it extremely easy for new developers, project offerers, and aspiring cryptopreneurs with no coding experience to design, build, market, and crowdfund their new Unsinkable token ecosystem. Unsinkable ICOs could use pre-ICOs or even private sales for immediate funding if those tokens are vested until company tokens can be sold with enough profit deposited into the buyback account to maintain Unsinkability. UNSK is using a small pre-ICO with vested tokens - no initial buyback, and not part of the circulating supply, to generate immediate funds for SSC dev. Ok, got it! So you reduce the risk for the public buyers who enter after the "smart-money" entered with higher risk and less guarantee. I assume the pre-ICO would demand a lower valuation than the public, but it makes sense. Correct. Using TUIS, even if the issuer had a preferentially priced private sale, those tokens cannot enter the circulating supply unless the buyback offer increases proportionately to accommodate an ICO-price buyback offer covering the additional circulating supply. There must be some incentive for pre-ICO investors to forgo the money-back guarantee and purchase the vested, higher-risk, pre-ICO tokens. In the case of UNSK, there is a 100% bonus, but the vestment unlock is dependent on UNSK/XLM minimum price in addition to time. Thank you for helping me get this clarity of purpose. I'd say you answered the "Why" question far better than I did. TUIS is intended to protect the general public from predatory ICO tokenomics like preferentially priced private sales and pre-ICOs, exit scams, and greedy token distributions. Also issuer incompetence. We also have sales decks now! Decent. I have made significant progress on the website and newcomer educational materials. SSC dev is slower then I had hoped. SSC devs are in high demand, with low supply, so my dev has many other projects (that presumably have more funding and are paying better). Hopefully we will get some funding from SBC and I will be able to properly compensate him to pick up the pace and/or hire some more devs to help him. Unfortunately SBC judging has been pushed back a week, we should know by Sep 7 if we won some funding. I have been hesitant to push the ICO out to ICO listings until minimum SSC functionality is complete. I would like to have automatic buyback, price-lock HODL, and the immutable crowdfunding contract ready before we make a big marketing push to potential investors. We have gotten our stellar.toml working and our assets are on stellarport, but no investment yet. I actively post updates on Telegram and a weekly update on the Unsinkable.io blog. Thanks for your interest! I hope to have more updates soon. I will update the roadmap once we find out if we have any SBC funding. We have just released a major update to the HODL Wallet! The update includes a testnet ICO offering with automatic buyback. Please make an account (you can use a fake email, there's no confirmation) and let us know of bugs and suggestions! We have the first iteration of HODL working on the testnet HODL Wallet!